The Legislature remains on a summer campaign break with no sessions scheduled until after the Aug. 7 primary election. Rather than votes, this report contains some interesting or noteworthy recent bill introductions. Introduced by Sen. Steve Bieda (D), to require prescription pill jar labels to have the number of a substance abuse hotline on them. Referred to committee, no further action at this time. Introduced by Sen. Rick Jones (R), to require firearms dealers to notify law enforcement officials when a person tries to buy a gun but fails the instant background check required by federal law. Referred to committee, no further action at this time. Introduced by Sen. Jim Stamas (R), to prohibit a local government from paying a commission or a cut of vehicle tow-truck (wrecker) recovery or towing service fees from a towing service in exchange for steering business to that company; and ban towing services from offering this. Referred to committee, no further action at this time. Introduced by Rep. Peter Lucido (R), to take away the post-retirement health insurance benefits granted to a state employee who is fired or resigns for willfully and wantonly neglecting his or her duty. Note: Unlike pension benefits, providing post-employment health insurance benefits is not a binding obligation on the state. Referred to committee, no further action at this time. 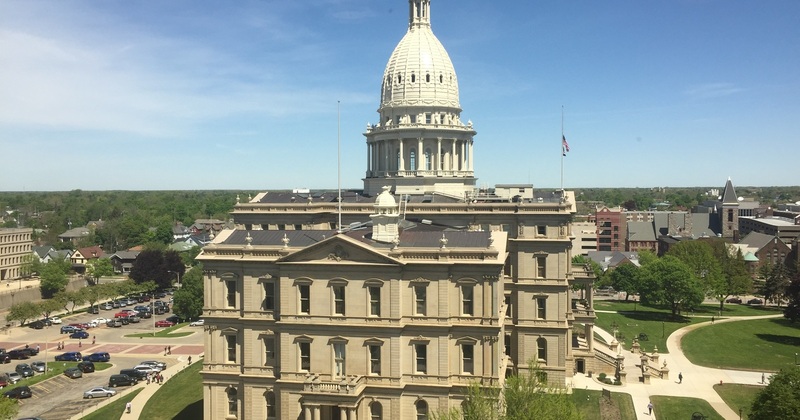 Introduced by Rep. Peter Lucido (R), to prohibit the disposal in Michigan landfills of out-of-state and out-of-country solid waste if Congress passes a law authorizing states to do so. Under current federal law and international treaties, states may not prohibit solid waste imported from other states or Canada. Referred to committee, no further action at this time. Introduced by Rep. Tom Barrett (R), to ban local zoning ordinances from banning the use of a barn or other facilities located on land zoned for agricultural purposes as a commercial venue for weddings or similar events. Local governments could still regulate noise, advertising, traffic, hours of operation, or other related conditions. Referred to committee, no further action at this time. Introduced by Rep. Peter Lucido (R), to allow bank and financial institution officials who in good faith and with good cause suspect that financial exploitation is being committed to delay the disbursement of funds from the account of an individual who is age 65 or older, or under some form of court-ordered protection or guardianship. The bill would require notice be given to specified officials and family members. The delay would expire in 15 days unless the bank determines the disbursement is legitimate, or a court orders the hold to be extended. Referred to committee, no further action at this time.